So, before engagement shoots, one of the things that Craig gets to do with our couples is meet them in person at the consultation meeting and really get to know one another. One of the things I get to do is plan the engagement shoot with them. The most fun part of that is discussing their outfit choices! So, I texted Melvin to see what they had so far, and he said, "I'm wearing 1800 colonial american clothes.. and tori is wearing the swim suit from borat." (exact words). All I could do was look at Craig, but he was on the phone, so I just looked up and wondered what was going on. I thought, "Oh my gosh... did I miss something about this shoot? What is going on? Did Craig not communicate something to me?" Not knowing how to reply, Melvin texted, "Jk hehe" LOL!!!!!!!!!! I laughed so hard because he got me good. LOL! That is something Craig would totally do! All the ice broke right then, and I just knew that our time with this couple was going to be pure fun, and it sure was! Melvin and Tori were such a delight to be around. Although it was so MUCH colder than we would have liked, laughter never ended, and we all became such a great team very fast. I especially want to give Tori a huge shoutout for not even complaining about the cold... I don't think she even said the words, "It's so cold" even once. She's a team player, and I could just sense their genuine love for one another all throughout the shoot. They balance each other so well! 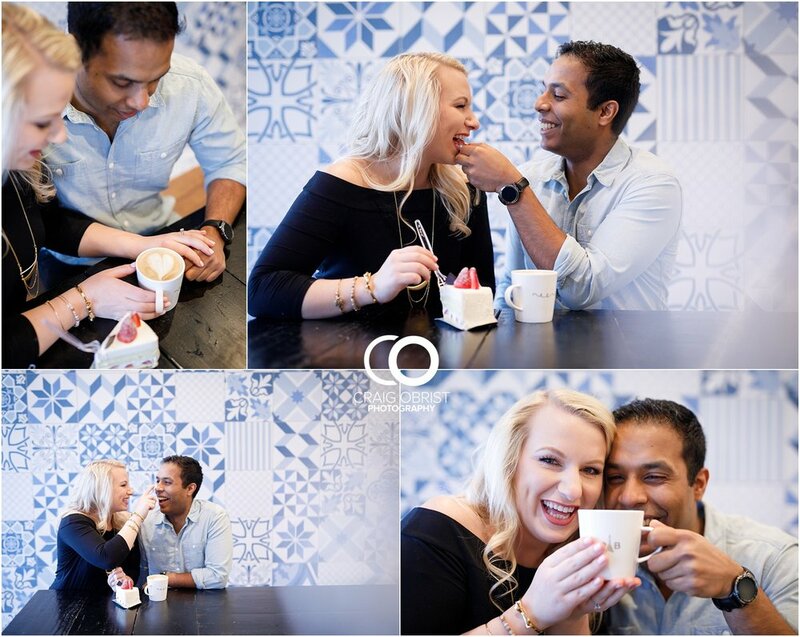 I loved that they personalized their session theme by incorporating something they love... COFFEE! We all researched online for some cute local coffee shops, and Paris Baguette was THE one that fit our couple the best! The staff there were so sweet in accommodating us and what we needed for our shoot, and for that, we thank them so much! You guys should definitely try that place out! Tori + Melvin, it was quite a pleasure getting to know you both... thank you for being so beautiful inside and out. I know that you guys will have a wonderful marriage with so much laughter and joy. Thank you for pushing through the cold and making this shoot a great success! We can't wait to see ya'll again on your BIG day! Cheers!